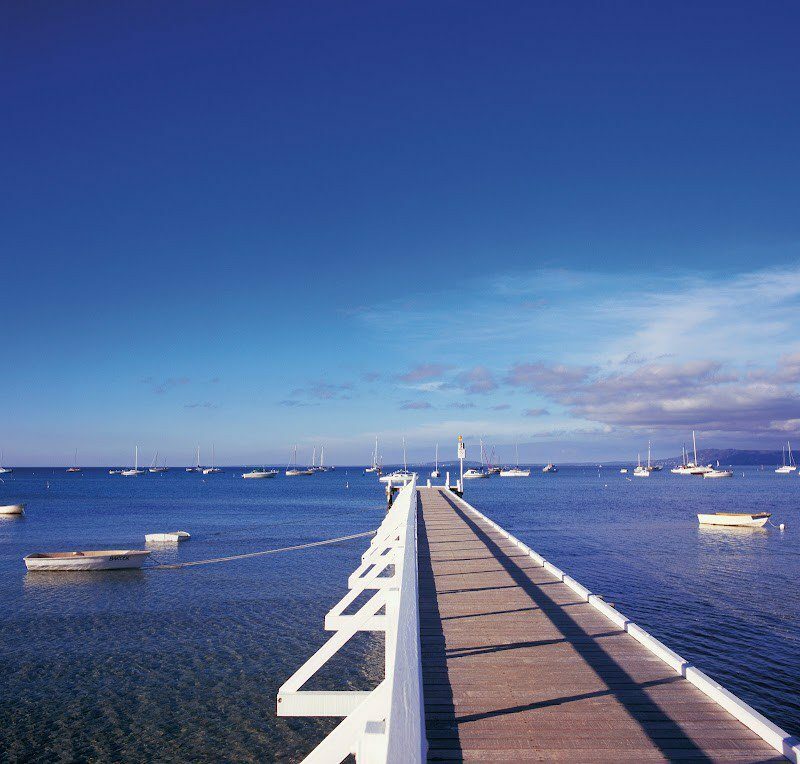 Anchor Belle Holiday Park in Phillip Island is the ideal holiday destination. Anchor Belle Holiday Park is a family friendly holiday park located centrally in Cowes, two kilometres from post office and 100 metres from a safe swimming beach. 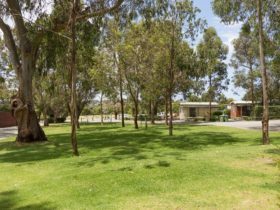 With a jumping cushion, ball park, playground suitable for children and an indoor heated pool open most of the year, including all Victorian school holidays (closed mid July to mid September). Free Wi-Fi also available. Anchor Belle offers luxury town house units with three bedrooms, two queen beds and two singles in the third bedroom, linen, towels supplied. Upstairs contains kitchen, lounge, dining, balcony, flat screen television, DVD player. Private outdoor courtyard, barbecue, outdoor setting and lock up garage. 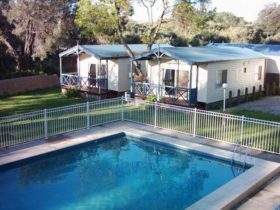 Two bedroom Deluxe Cabins include bedding (queen bed), second bedroom two sets bunks, bedding and linen supplied, lounge and dining area, two couches, air conditioning, television and DVD player. 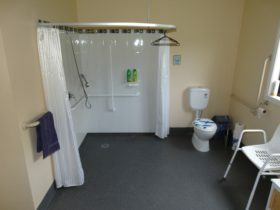 En-suite sites and grassed powered sites, barbecue’s, large enclosed campers kitchen and barbecue area and games room. 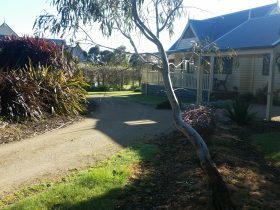 Only 100 metres from the beach and 200 metres from the boat ramp. 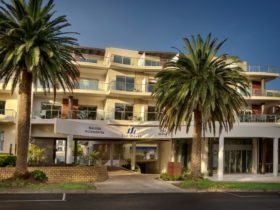 Well-equipped kitchen with large full size oven, microwave, fridge, freezer, lounge and dining area, comfortable leather lounge suites, large flat screen television with DVD player. Good size veranda and outdoor setting. On arrival enjoy the complimentary tea and coffee starter kit. 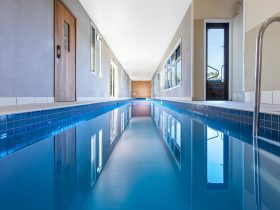 Anchor Belle Holiday Park’s luxury two storey self contained Town House Apartments at Cowes consist of three bedrooms; two queen rooms and two singles in the third bedroom-linen and towels supplied, all on ground floor with reverse cycle air-conditioning all rooms. Second storey of the luxury townhouse apartments consists of well-equipped kitchen with large full size oven, microwave, fridge freezer, smart stone bench tops, spacious living zones, large dining area, comfortable leather lounge suites, large flat screen television with DVD player. Two bedroom, queen bed, linen and towels provided. Second bedroom has two sets of bunk bends. Please bring your own or hire linen and towels. Fully equipped kitchen with full size fridge microwave. Dining and lounge area with colour television and DVD player. Powered sites start from $40 in low season. Townhouse units over Grand Prix High season, Deluxe cabins range from $115 to $245.